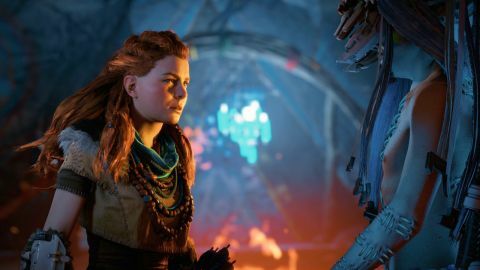 Horizon Zero Dawn: The Frozen Wilds review: "Makes me remember why I fell in love with Horizon to begin with"
Made for those who have devoured the whole of Horizon: Zero Dawn, this DLC isn’t just about upping your game. It’s a rich expansion of Aloy’s world, with flashes of comedic brilliance and narrative depth. Remember how it felt to see a Sawtooth for the first time? That thrill, the excited fear, your heart thumping as you hide in the red grass while the machine prowls around. Your controller vibrating softly, then more insistently as its footsteps got closer. If it had muscles, you’d have been able to see them rippling. Horizon Zero Dawn: The Frozen Wilds brings back this exhilaration. Because not only is it filled with new machines, environments, and stories - it’ll also teach you a harsh lesson about Aloy’s mortality. Basically, it’s challenging as hell. And that’s no bad thing. A Daemon is infesting the Cut, a snowy territory inhabited by the Banuk. Corrupting machines similarly to the entity from the base game, the sudden appearance of crackling smoke rising from Thunder’s Drum volcano is definitely not a coincidence either. Enter Aloy. Unsurprisingly, she takes it upon herself to expel the Daemon once and for all. While the hot springs and gusts of snow blowing over the hard earth make for some stunning photo mode opportunities, don’t let them fool you: this environment is as unsympathetic as the new machines you’ll meet. Yet these surroundings are a welcome departure from the familiar grassy plains you’ll have been used to in the base game. The attention to detail makes you believe that Aloy is freezing cold: she wades through drifts of deep snow, spouts new lines about how cold it is if you don’t wrap her up warm, and her armour gets dappled with white when you stray away from the sheltered settlements. Inhospitable yet stunningly beautiful, the Cut is the perfect setting for this new adventure. Mind you, the semi-camouflage from the snow don’t do anything to help you when you come face-to-face with the Frozen Wild’s three new machines. By the All Mother, they’re tough sons-of-female-dogs. For those that relish a challenge, the difficulty level is perfect. Fighting them isn’t a test of firepower; it’s a test of skill. Doesn’t matter if you have the powerful Banuk Sharpshooter bow or the new Stormslinger (think shotgun that fires electricity) without a disciplined strategy you’ll be robot chow in no time. Because although the new machines - which I won’t spoil by describing - are gigantic, lumbering beasts, they’re fast. Tackling them for the first time perfectly replicates the “what the hell is that! ?” sensation way back from encountering your first Rockbreaker or Stalker. That initial shock makes it clear that you’re going to need a new set of tactics for taking them down. With such merciless attacks, it’d be easy for the elevated level of combat to feel unfair. But it doesn’t. Instead you’re pushed to switch weapons frequently, keep your distance, and always, always choose dodging over getting in one extra shot. It’s a harsh reminder of the dangerous world Aloy lives in, something that’s easy to forget once you’ve reached the level 50 cap in the base game. Even at level 47 (the recommended level for the Frozen Wilds is 30, and the level cap has been raised to 60) and with the most powerful weapons in the game at my fingertips I had to stay on my toes. Otherwise Aloy very rapidly turned into a bright red stain in the snow. The Frozen Wilds isn’t all blood (or machine fuel - if everything goes to plan) and fighting, though. The upgrades to facial animation are palpable. In the space of seconds I saw sadness, regret, and brash confidence flicker over an Oseram’s face in a sidequest. At one point Aloy facepalmed with such despair that I almost choked on my mouthful of tea. Turns out Guerrilla is pretty damn good at comedic timing, as in another instance Aloy’s comeback practically left singe marks on her opponent. The Frozen Wilds is worth playing for its new characters alone. Each one has the depth you’d expect from some of the best narrative games around, as the writers take the stereotypes you thought you knew - stoic chieftain, smooth-talking merchant, rebellious adolescents - and weave them into character arcs. Guerrilla’s character wizardly never ceases to astonish. Sadly, the amount of sidequests just isn’t enough. There needs to be more. If you procrastinate from finishing the main quest (we’ve all been there), there are only about eight sidequests to occupy yourself with. Considering the map is about a quarter of the size of the base game, the world feels empty after the main quest is done and dusted. It’s a shame as the quests available are great, but I just want more excuses to spend time in the Cut once the Daemon business is taken care of. Plus there aren’t as many revelations in the main questline to make you fully understand where the Daemon comes from, or what it wants - if you want answers, you’ll have to spend quite a while chatting to a particular character once you’ve completed the main quest. In the base game Guerrilla avoided this slightly tedious way of providing backstory by devoting time to the exploration of ruins, a revelatory storytelling mechanic that feels sidelined in Frozen Wilds. Despite that one gripe, one thing remains clear: The Frozen Wilds makes me remember why I fell in love with Horizon to begin with. A breathtaking new environment, enemies that simultaneously intimidate and fascinate, and characters that prove Horizon Zero Dawn is about far more than fighting robots. It arrives at precisely the right time to catch all of you who’ll have rinsed the main game for content and have probably already reached the level cap. But even if you’re comfortably sitting at level 50 and can take down a Thunderjaw without breaking a sweat, dear god, don’t underestimate the Frozen Wilds. It isn’t for the faint-hearted. Mind you… I think we all know one flame-haired person who never shies away from a challenge. Description A post-apocalyptic action RPG set 1,000 years in the future, after mankind's technology has been overtaken by nature.